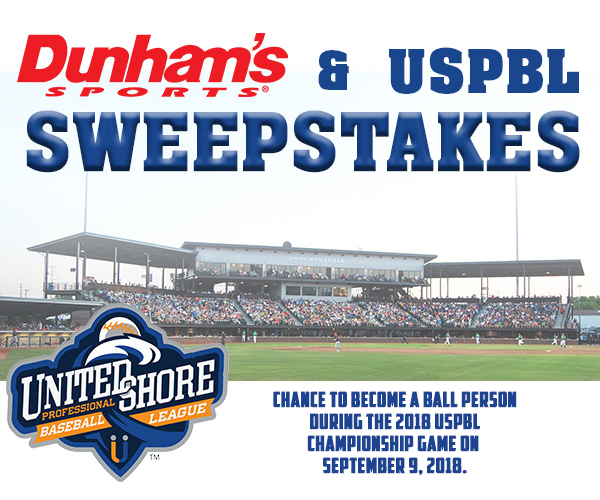 Fans can enter the “Dunham’s Sports USPBL Sweepstakes” for a chance to be the ball person during the 2018 USPBL Championship Game on September 9th. PRIZE: Only (1) winner will be chosen randomly from all eligible entries for a chance to be the ball person during the 2018 USPBL Championship Game on September 9th. This sweepstake will run from August 1, 2018 – August 31, 2018. The sweepstakes winner will be announced on Monday, September 3, 2018. View Official Sweepstakes Rules. Sweepstakes winner will be notified by phone and/or email. By signing up for this Sweepstakes, users also signed up for the Dunham’s Rewards email program (discounts, coupons, and local sales information from Dunham’s). You may opt-out at any time.